Three talented Portland Public high school students today presented their poems as part of the Poetry in Motion 2014 program. 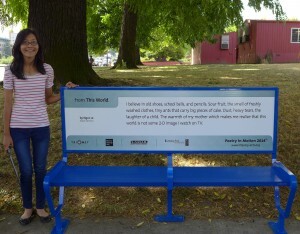 The program features 10 poems, with excerpts displayed on TriMet buses, benches and shelters throughout the region. 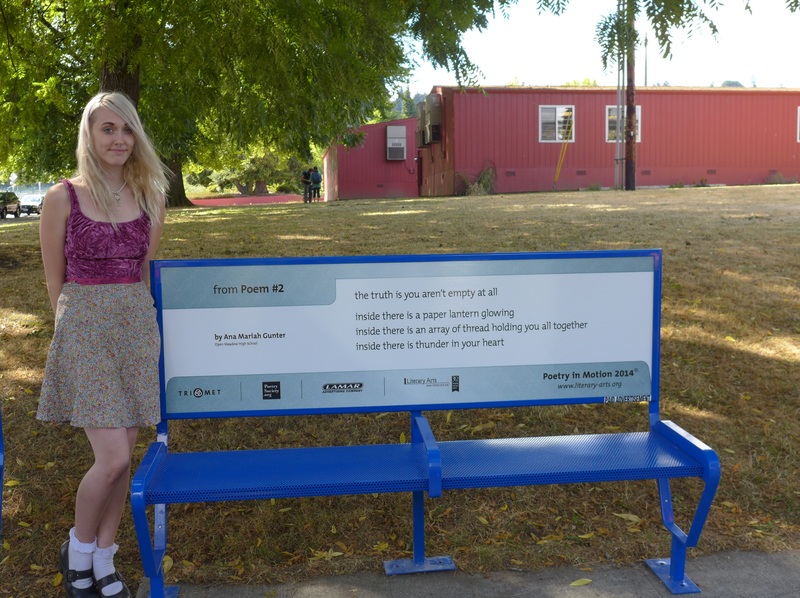 In addition to the students’ work, three Oregon poets and three national poets have their work displayed on TriMet facilities. In all, the 10 poems will be displayed on 40 buses, 22 benches and 11 shelters around the region. Andrew Proctor, Literary Arts executive director kicked off the 2014 program outside Lincoln High School, where one of the local poets selected was a senior. Open Meadow High School senior Ana Mariah Gunter read her “Poem #2”, with an excerpt being displayed as part of Poetry in Motion. Gunter is 17 and worked with Writers in the Schools writer Casey Fuller. Madison High School junior Ngoc Le read her poem “This World”, with an excerpt being displayed as part of Poetry in Motion. Le is 16 and worked with Writers in the Schools writer Mark Pomeroy. 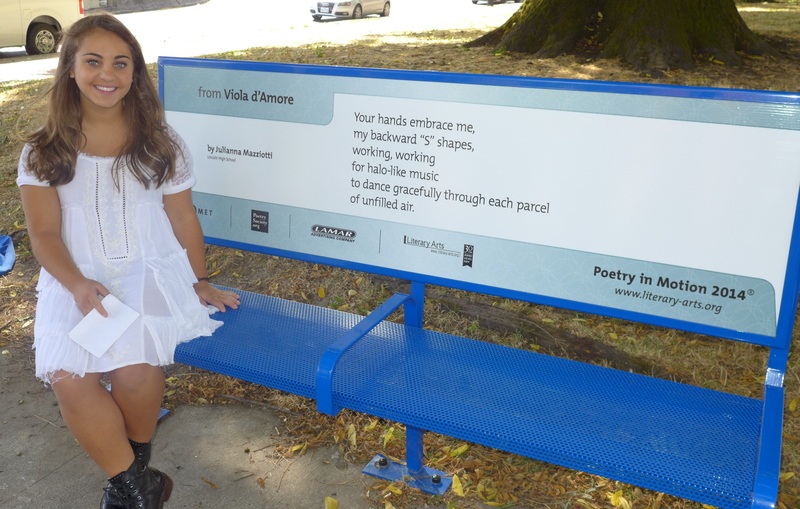 Lincoln High School junior Julianna Mazziotti read her poem “Voila d’Amor”, with an excerpt being displayed as part of Poetry in Motion. Mazziotti is 16 and worked with Writers in the Schools writer Cindy Williams Gutierrez. Poetry in Motion is a partnership between TriMet, the Poetry Society of America and Lamar Advertising. The program was first established in New York City in 1992. Portland became the first west coast city to participate in 1997, joining New York, Chicago and Boston. The program has since been featured in 20 cities, enriching riders experience on transit. Founded in 1984, Literary Arts is a community-based nonprofit literary organization located in downtown Portland. This year we’re celebrating 30 years of serving Oregon’s readers and writers. Their programs include Portland Arts & Lectures, one of the country’s largest lecture series; Oregon Book Awards & Fellowships, which celebrates Oregon’s writers and independent publishers; and Writers in the Schools, which hires professional writers to teach semester-long creative writing workshops in Portland’s public high schools. We also host guided discussion groups around great works of literature through a program called Delve.